Click here to take the World's Smallest Political Quiz and see where you stand. Here are my results, which might help people understand me and some of my views. 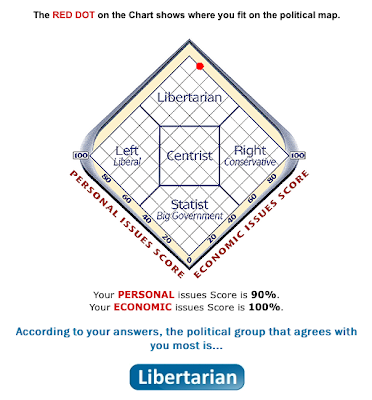 Well according to the test results I am 80%/100% Libertarian. I just can't fathom having a free-drug society however - or a prostitution-legal society for that matter. This was tried with dismal failure in Holland, my forefathers country. One could say that they have the most Libertarian society on earth, but it has not been successful. Anyway, I hate the media bias that disallows third-party candidates there proper place alongside the republicrats in national debates. Not fair in the least. Not since Perot has this been allowed - only because Perot had the financial backing. What would it take for a third-party candidate to win and do you feel it is even possible? I live in Michigan which - because of Detroit - votes Democrat. I have voted for a third-party candidate in the last few elections but it seems doomed. I believe all things rise and fall according to their value to society. The Republican party is in a slide right now, and it's conceivable that should that slide continue and they are no longer able to compete against the Democrats, that an alternate party could emerge to become one of the two contenders.